Home » What is Lift Check Valve ? Check valves are designed to prevent the reversal of flow in a piping system. These valves are activated by the flowing material in the pipeline. The pressure of the fluid passing through the system opens the valve, while any reversal of flow will close the valve. Closure is accomplished by the weight of the check mechanism, by back pressure, by a spring, or by a combination of these means. 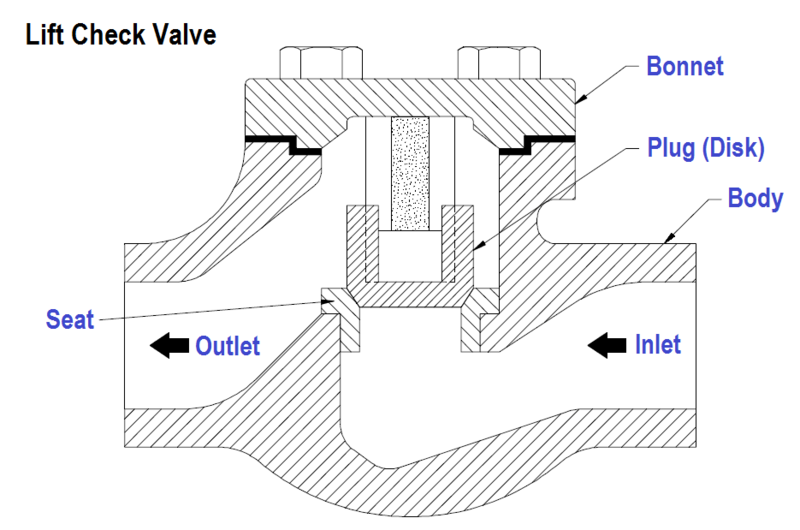 The general types of check valves are swing, tilting-disk, piston, butterfly, and stop. A lift check valve is commonly used in piping systems in which globe valves are being used as a flow control valve. They have similar seating arrangements as globe valves. Lift check valves are suitable for installation in horizontal or vertical lines with upward flow. They are recommended for use with steam, air, gas, water, and on vapor lines with high flow velocities. Flow to lift check valves must always enter below the seat. As the flow enters, the disk or ball is raised within guides from the seat by the pressure of the upward flow. When the flow stops or reverses, the disk or ball is forced onto the seat of the valve by both the back-flow and gravity. 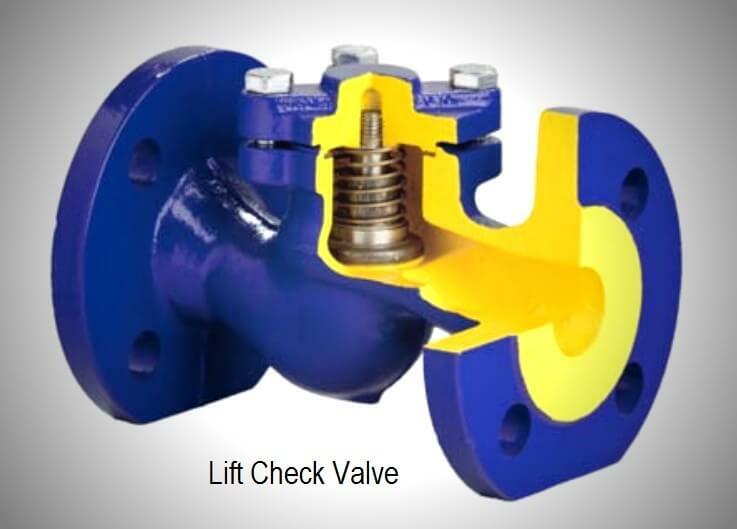 Some types of lift check valves may be installed horizontally. In this design, the ball is suspended by a system of guide ribs. This type of check valve design is generally employed in plastic check valves. The seats of metallic body lift check valves are either integral with the body or contain renewable seat rings. Disk construction is similar to the disk construction of globe valves with either metal or composition disks. Metal disk and seat valves can be reground using the same techniques as is used for globe valves. The lift check valve is a valve which prevents the suction line from running empty, e. g. after the pump has been stopped. Priming the pump prior to a re-start is therefore no longer necessary. Spring-loaded lift check valves can be installed in the piping in almost any mounting position. Compared with swing check valves, their head losses are higher as the deflection of the flow is much more significant. Lift check valves are preferred when applications require smaller nominal diameters. What is Swing Check Valve ? How is Pressure Drop Calculated through a Valve ?